English musician, singer and guitarist BILLY MORRISON has confirmed Friday, October 23 as the release date for his new (and second) solo album, GOD SHAPED HOLE, to be released on his own King Mob Music label. Morrison, who currently plays guitar in Billy Idol’s band and co-wrote many songs on Idol’s latest KINGS & QUEENS OF THE UNDERGROUND album, is joined by Idol bandmates Steve Stevens and Erik Eldenius, Jane’s Addiction’s Dave Navarro and rock legend Ozzy Osbourne (lead vocals on “Gods,” a Morrison/Osbourne co-write) for the new album. 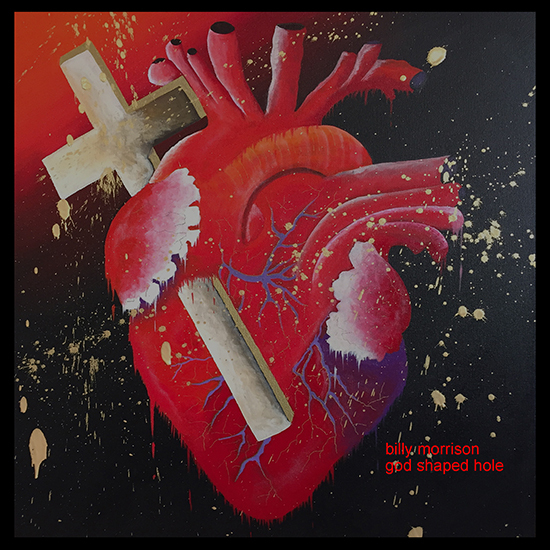 GOD SHAPED HOLE (co-produced by Morrison and Erik Eldenius) was mixed by Mike Clink (who produced Guns N’ Roses’ landmark debut album, Appetite for Destruction) and John Spiker. Beyond his commitment to music, Billy Morrison is an accomplished artist who has been featured at the Branded Arts exhibition at Mann’s Chinese Theater, in the 2015 LA Art Show and at The Village Studios. His new exhibition DIS-EASE–a gallery of the rocker’s original collection of fine art–will debut Wednesday, September 2 at Mouche Gallery in Beverly Hills, CA. The original acrylic on canvas work, GOD SHAPED HOLE will be for sale at the show. The collection will be on display in the gallery until September 8th. GOD SHAPED HOLE will be available via i-Tunes and Amazon for $9.99, with individual tracks available for 99 cents, with the exception of “Gods” which is only available as an album track. A Friday October 16 pre-order ($8.99) of the album will include two Instant Gratification tracks “Baby Hurricane” and “Alone In A Crowd,” when the album is pre-ordered. In addition, a limited number of “Art Packs” will be available Friday October 9 for pre-order via Morrison’s Big Cartel store. CLICK HERE FOR BILLYMORRISON.BIGCARTEL.COM..
Just 200 of these Art-Packs will be manufactured and each pack contains an exclusive hard copy physical CD (numbered and signed), a fine art 18” x 24” lithograph print on 255mg Somerset Velvet Archival stock of the album cover (numbered and signed), a hand written lyric sheet, glossy (signed) photograph and set of 4 Billy Morrison guitar picks. “Art Packs” are available at $175 + shipping and will be shipped on within two weeks of purchase. These will be the only physical hard copies of the album available anywhere.